2. sleepout with 2 bedrooms, open plan lounge and kitchen and large yard. The properties are located a short 100 mtr stroll to the main street cafes and a quick 500 mtr walk to the beach,skate board bowl and park, children's adventure play ground or mini golf.... you choose!... and you don't even need a car! 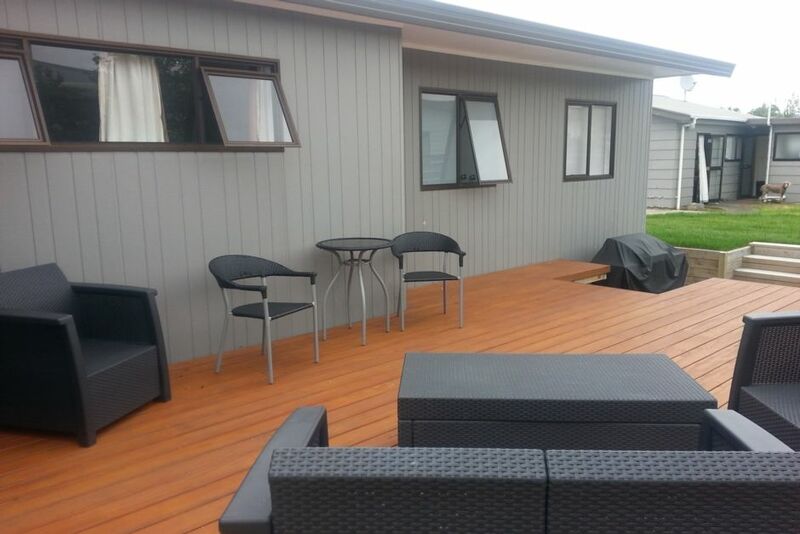 Whether you want to spend time at the beach or prefer to explore the shops, cafes and art galleries of Whangamata, this property is located perfectly for you. Plenty of off street parking for car or boat and plenty of room for the kids! (if you like warm fires in winter, try going on a pine cone hunt with the kids) the pot belly in lounge works well. Or you may just want to watch movies from our library of over 100 dvd"s to select from. If there's something you need for your stay e.g. BBQ, please let us know and we can accommodate your request at no additional charge. Ideal for extended family holidays. We rent to one family who are responsible for their guests at the property. Only available to persons 25Years and older. Under 25s with Adult supervision. proximity to all entertainment and shops offering a full holiday experience. short stroll to ocean beach about 500 mtrs or less from shopping main street. Double burning tiled wood burner. numerous car spaces for parkling including off road boat parking. Two i main house and one in sleep out studio. Free view supplied Sky is available if you bringyour own equipment. large rear deck for entertaining. Plus smaller front deck to view the beach hop parade. We all had space and our Christmas celebrations were just wonderful sitting round the large table in the kitchen. The kids played outside and were safe. Good contact with the owner when we were unsure about small things. Thank you for your lovely review. We love to offer our holiday home to clients such as you who leave the property in a wonderfully clean and tidy condition. You are welcome to rebook again for next year's holiday season. As usual, we had a great time at this awesome holiday house. Very clean and well equipped. It's the perfect location and very good for a large family group. Would love to come back. Thanks so much for your lovely review. We are happy to rent again to our fabulous holiday clients. Property was perfect for our large group. Property was perfect for our large group. Great value for money. Living areas and outdoor areas were spacious for kids. Configuration of the back unit needs some thought as a bit difficult to move around, but other than that, we loved it and would be back to stay. House and location are A1+. House and location are A1+. House caters very well for our group and is so handy to main st shops and restaurants. Love staying at this property !!! Great set up for a large group with very handy location. a great spot to set off to explore what the Coromandel has to offer. Hot water beaches, gold panning and old railway adventures. Explore hiking trails and rain forrest mountain bike tracks. Or maybe just laze around the numerous bays and beaches around the region. Whangamata is also the home of our 5 day 50s & 60s Beach Hop celebration show casing hot rod cars, lifestyle music and culture of that era.